← Signs of Winter 14: More on White-tailed Deer! Signs of Spring 1: Monarchs! As I reported last summer (Signs of Summer 8, July 25, 2018) monarch butterfly numbers and their reproductive efforts here in Western Pennsylvania looked good. The fields at Harrison Hills Park, for example, were loaded with butterfly weed and milkweed and also a great diversity of flowering plants that serve as nectar sources not only for monarchs but also for many other important insects and birds. In July Deborah and I spotted several large (possibly 5th instar) monarch caterpillars on these milkweed plants. 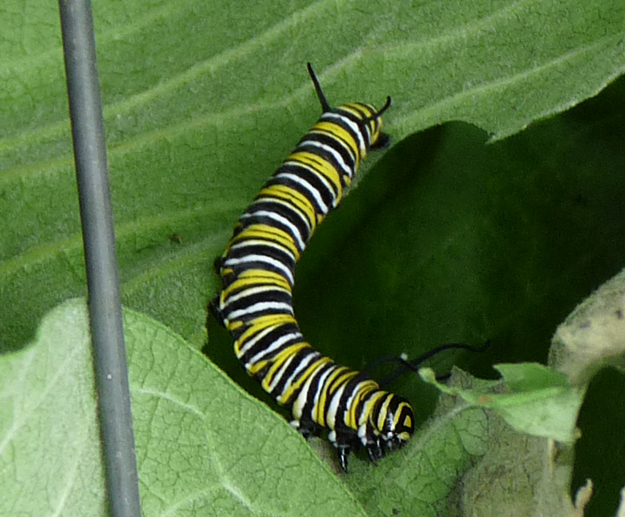 Also, a friend down in New Kensington reported monarch eggs on her milkweed, and some other friends who live along the Allegheny River near Freeport reported abundant monarch eggs and caterpillars on their milkweed! Monarchs were also frequently seen flying through Lower Burrell, Upper Burrell, Vandergrift and Apollo all through the late summer and early fall. We speculated that the warm weather last spring in Texas might have given the migrating monarchs a boost (March 2018 in Texas was 5.3 degrees F warmer than average!). It might even have kept them from flying into the unseasonably cold March weather in the eastern United States. When the migrating monarchs from Mexico stayed in Texas longer than usual they responded with a population boom! Although limited by the available milkweed, the Texas monarchs multiplied and then, as the weather in April began to moderate, surged out across the eastern and midwestern United States. 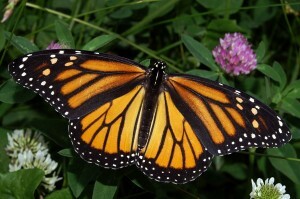 On-line monarch migration maps showed the steadily expanding line of migration of the butterflies: In March they had reached a line between Texas and Florida, by April they had traveled north to a line roughly between Oklahoma and South Carolina, and by May they were up to a line between Kansas and Maryland. By early June they had reached a line between Iowa and Ohio, and by late June had finally gotten to Pennsylvania, New York and New England. The monarchs reproduce all along their migration route (so milkweed is critical at each step!). At each milkweed stop females, after mating, lay three to four hundred eggs on the milkweed (spreading their eggs out over a large number of plants). Then the adult monarchs die. The eggs hatch in three to five days depending on the temperature, and the emerging larvae (the “caterpillars”) feed first on the egg capsule and then begin to eat the milkweed leaves. They molt five times during their larval life stage and increase their body mass more than two thousand times. The caterpillars take between 9 and 14 days to go through their five growth phases. By late July, migrating adults and caterpillars in many stages of coming and going were all over Western Pennsylvania. Pennsylvania is just one of stops on this seasonal northward surge and eventual southward retreat of monarchs. Some of the adult monarchs that hatch here in mid-summer might, in a typical year, continue on north to lay more eggs on the later growing milkweed in New York and New England. 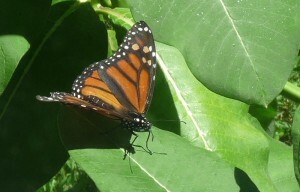 Other monarchs that mature here in late summer, though, will turn around and begin the long journey back south. These late summer/early fall born monarchs are part of the overwintering cohort that tries to find its way to the coniferous forests in the mountains of the Mexican states of Michoacán and Mexico. These overwintering monarchs live 8 or 9 months (compared to 2 to 5 week life span of the “summer” monarchs) and will be the individuals that push back north into Texas next February and March where they will mate and lay eggs and start the migration cycle all over again! This past fall reports from all over the eastern and midwestern United States matched what we had observed here in Western Pennsylvania. Numerous migration roosts (resting gatherings of migrating monarchs) were reported in New York, Ohio, Michigan and all across the upper Midwest. Many of these roosts contained more than a thousand individual butterflies! There were more monarchs migrating south this past year than had been seen in many years! Also, the Fall 2018 weather here in the East was quite mild. Summer-like conditions hung on well into the fall and may have given the migrating monarchs another boost! 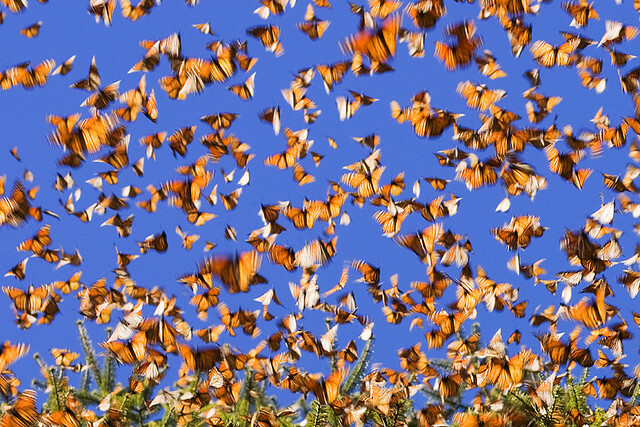 One of the most accurate ways to access the monarch butterfly population is to count them when they are in their overwintering forests in Mexico or, even easier, to measure the area of the forests that they occupy. The most recent overwintering data has just been released. For the 2018/2019 season 6.05 hectares (16.3 acres) of forest were filled with overwintering monarchs! This is represents a 144% increase over last year’s occupied forest area and is the largest forest area occupied by monarchs since 2006/2007! The Eastern monarchs, then, finally had a good year! There is also a western population of monarchs that is separated from the eastern monarchs by the Rocky Mountains. These western monarchs overwinter in the coastal forests of California rather that the mountain forests of Mexico. The Xerces Society for Invertebrate Conservation conducts a yearly census of these western monarchs. Their findings this year are very disturbing. They counted only 28,000 overwintering monarch butterflies in their study sites. This represents an 86% decline from the 2017/2018 count and a 99.4% decline from the 4.5 million monarchs that overwintered on the California coast back in the 1980’s. This decline in monarchs is attributable to many factors. There has been a precipitous drop in the total area of milkweed patches throughout the west primarily due to herbicide use and urban development. Also, the continuing hot weather and drought, thought to be directly attributable to climate change, has led to extensive wildfires that have destroyed vast areas of forest and wild plants needed by the monarchs for roosting, cover and nectar. Under the stress of all of these pressures, the western population of monarchs could, according to some experts, be extinct in less than twenty years! So many people around the country are trying to pitch in to save the monarch! Monarchs, though, all across our country, are still gravely threatened by habitat loss, pesticide and herbicide use, and climate change. Plant some milkweed! Plant native plants (for nectar fueling sites!)! Use fewer herbicides and pesticides! All of Nature will benefit from these steps, and we will continue to help to bring the monarchs back!